Recently, it has been reported that basketball sensation Stephen Curry has an eye condition called keratoconus. He has been squinting and blinking the whole time and still manage to be in the top 5 for the highest 3-point field goals completed. Now he is wearing contact lenses to help him see better, we are excited to see what he can do! It is a condition where the front layer of the eye (cornea) continues to thin out resulting in a cone shape instead of the normal spherical shape (see pic below). Traditional eyeglasses and contact lenses can generally provide clear vision for early and mild keratoconus. As the condition progresses, specialty contact lenses are needed to provide a clear vision. There are currently no treatments to reverse keratoconus, however, it can be stopped or slowed down the progression. This procedure is called collagen cross-linking (CXL) and it essentially “freezes” the cornea from thinning out. Another option would be Intacs, which are plastic rings that are implanted in the cornea. This method flattens the cone-shape and resulting in a more spherical shape cornea. 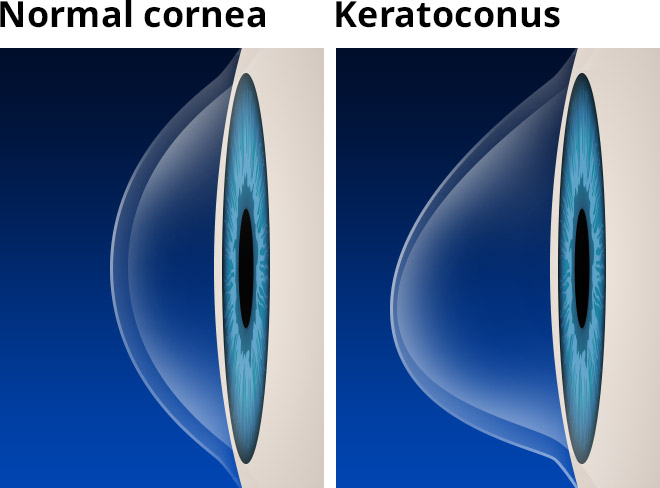 Corneal transplanted is considered when keratoconus is severe. At this point, a surgeon would replace the unhealthy cornea with a more viable and healthier one. It is reported that 1 in 2000 people suffer from keratoconus. However, it can be easily managed if you are aware of your condition early on. So it is important to regularly get your eyes examined. If you feel like your vision is never clear with glasses and regular contact lenses, you may be at risk of keratoconus. Give us a call or e-mail us to schedule your eye exam! Hope this helps you understand a bit about keratoconus. Now let’s see how Stephen Curry will do now he has new and improved vision!